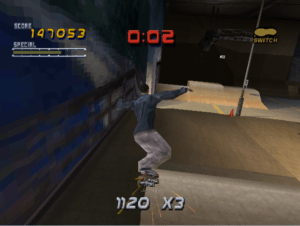 Ah, yes, it’s been two years now for me at JGR, and what better way to celebrate than to take a look at a game that was one of the legit highlights of my childhood (Spoiler Alert: it’s getting a high score), Tony Hawk’s Pro Skater 2, for PlayStation. Why the PlayStation version, you ask? Because a review of this magnitude requires the proper soundtrack, and I can’t count on the N64 version for that. I’m not sure, but I think this qualifies as “too much air”. 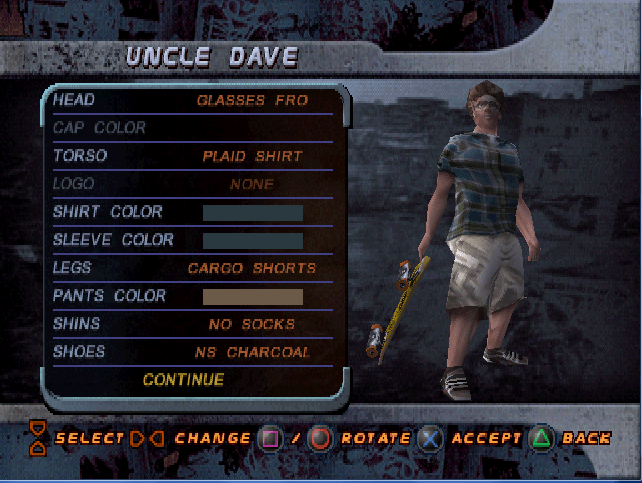 THPS2 is, in my opinion, the Platonic Ideal of Tony Hawk games, and the moment I’d point to as when the series peaked. It takes everything that worked so well in the original and gave it the “Bigger, Faster, Better, More” treatment. The roster has expanded a good bit here, bringing everyone back from the first game, and adding luminaries like Rodney Mullen and Steve Caballero. Skaters are broken into three groups, Vert, Street, and All Around, which dictate what stats and movesets they begin with. You can upgrade your stats and unlock new decks for skaters, same as last time, but instead of earning them with videotapes, the currency of the first game, here, you actually get cash to spend. To that end, Career Mode has been expanded quite a bit. There are now ten tasks to complete per level, each holding a different dollar value, and although many of them are rehashes from last time (Collect SKATE, Score X Points, Find the Secret Tape), there are some that are a little more involved, like having to perform certain tricks at certain spots in each level, and yes, jumping over a teleporting bum that lives on Venice Beach. Each locale is also peppered with floating cash with Tony Hawk’s mug plastered on it, with an extra bonus for passing each task and collecting all the loose cash in a stage. The competition levels also return from last time, with hefty rewards for taking gold, as well as special unlockable videos; medal in all three competitions with any skater and you’ll get a compilation of wipeouts that warm my cold heart, get gold in all three and you’ll get a highlight reel of your skater. Also, if you 100% complete every level, you’ll unlock a cheat ranging from low gravity to perfect balance. I don’t think that’s how you’re supposed to stand on a skateboard. 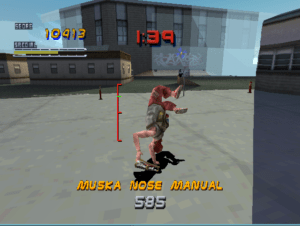 One major improvement that needs mentioning is that skaters’ movesets are now customizable; you can both assign tricks to certain button combos as well as use your fat stacks of cash to purchase new moves your skater didn’t start with, so if you want Rodney Mullen to be capable of busting out the 900, or Tony Hawk to add the Darkslide to his arsenal, you can. THPS2 also added a new move, the manual, which adds a new dimension to the game entirely by allowing you to chain together huge combos while transitioning from one line to the next, with the help of a balance meter. Wall rides and “wallies” are also considerably easier this time, as well, allowing access to hard to reach places. Those may not seem like much, but they really add to the sense of treating the world as your skatepark that the series so prides itself on. The other major additions here are the Create-A-Skater feature and the fantastic Park Editor mode. You have a pretty wide range of options when creating a skater, from height and weight to shoes and socks, and you can put them through Career Mode to boost their stats as well. However, the Create-A-Skater pales to the awesome Park Editor, where you start with an empty patch of land and piece together rails, risers, halfpipes, quarterpipes, pungee pit booby traps (?! ), and can even create and name your own gaps. In fact, when this game came out, me and a buddy of mine created a park that became infamous for a feature called the Minibowl, a tiny sunken bowl capable of generating such insane speed and air that we actually managed to land a 1080, without the help of cheats. I’m sure that smacks of “cool story, bro” to a lot of people, but I think it says a lot when I can remember such a story from a game that came out fifteen years ago. You know you’re skating hard when sparks appear. Of course, no discussion of a Tony Hawk game would be complete without mentioning the soundtrack. As I mentioned in my review of the first THPS game for Nintendo 64, cartridge limitations and Nintendo Censorship took such a hatchet to the music that it basically no better than generic background fluff, and is a major reason we’re playing the PSX version here. It was a wise call, seeing as the sequel features scorching hot tracks from names like Rage Against the Machine, Naughty By Nature, Lagwagon, and Bad Religion (!!!). Of course, it also features Papa Roach, but hey, nobody bats a thousand, and even the weaker songs in the rotation get you pumped to go all out. As you’d expect, the other sound effects are high-quality as well, and the graphics are on par for a late PlayStation game. I did putt around with the N64 version when it was new, and the graphics there are a little smoother, not to mention the load times being decidedly shorter, but for the most part, this is the version to play if you have the option. 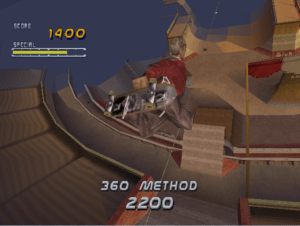 If you do pick up THPS2, you’ll have quite a bit to keep you interested for a good little bit. All the original game modes return from the original, both in 1 and 2-player mode, with the addition of 2-player Free Skate mode, which is a nice bonus. As I said, the Park Editor mode is great if you manage to get bored with the career levels and unlockable spots like Skate Heaven, and just in case, there’s a nice selection of pre-made parks using the Park Editor pieces, though they tend to be a bit on the gimmicky side, especially the fantastic “Montana” park. Also, for the completionist in all of us, there’s even a checklist for every single gap in the game, broken down by type, as well as a demo of a THPS spinoff, Mat Hoffman’s Pro BMX. Um…this isn’t an in-game screenshot, but it is a convenient excuse to show Rodney Mullen doing awesome things. Now, I’d like to say that this game is perfect and there are no flaws or hitches at all, but I do have to take my fanboy glasses off for a minute. First of all, even if you pick a vert skater and are just completely sold on the idea of big air all the time, eventually, you’re going to have to utilize street style at some point, as the point totals required in the later levels are damn nigh impossible without chaining together freakishly long combos, which leads to some unintentionally hilarious moments trying to make Tony Hawk or Bucky Lasek manual and kickflip their way to victory. Secondly, levels are still rather small, and some, you’re probably just not going to play outside of having to in Career Mode. Third, because you’ll eventually be resorting to the same tactics for the top scores and competitions, trying to march through everyone’s Career Mode in the hopes of beefing them up or unlocking the cheats is going to make you feel like you’re playing the exact same game the exact same way, only with a palette-swapped skater, and not everyone’s going to have the patience to trudge through that fifteen times. Tony Hawk’s Pro Skater 2 is one of those games that I’m pretty sure most everyone has played at some point. Much like the first one, I figure everyone either had it or knew somebody who did. I reiterate that I’d put it at the top of the Tony Hawk mountain as the best in the series, and if you haven’t happened upon it before, I would recommend it vociferously. 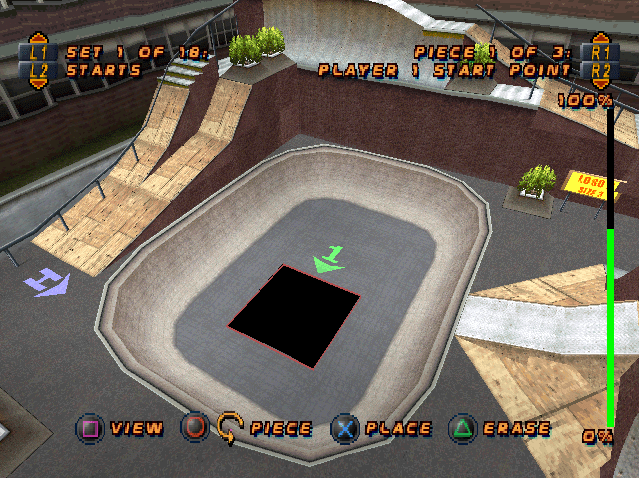 It’s familiar enough for veterans of the first game to jump into, and the little additions, especially the manual, add enough to the sequel to make sure it’s not Tony Hawk’s Roster Update, not to mention it’s hard not to like a game where you can hop on a charging bull and get points for it. There are a couple flaws, yes, but I’d say THPS2 is still well-deserving of the five-snowflake score, and if you pop it in, I think you’ll remember why. Takes everything that functioned so well in the original and adds to it, killer soundtrack, bigger roster, fun Park Editor and Create-A-Skater. Levels are still smallish, you’re going to have to learn street style whether you want to or not. Aren’t Papa Roach one of the great American bands? Literally every part of that sentence is a lie except the question mark. 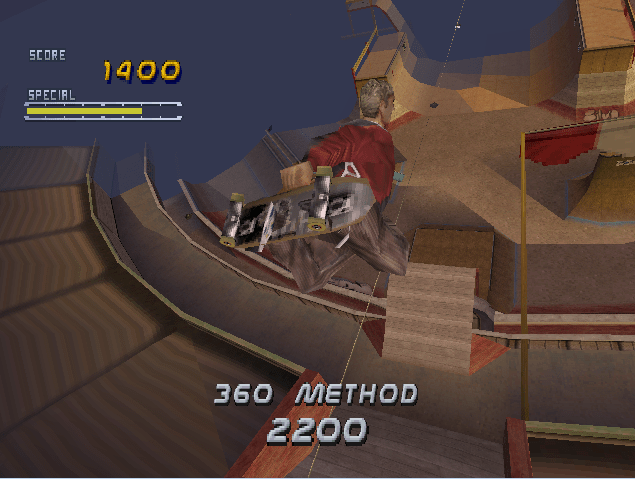 As for THPS2: Glorious. I got the game for my PC and played the hell out of it, with the Track Editor and enough Mods and Tools to change the music, skaters, download levels from the internet and all that i never got bored. Gameplay was hugely improved over the already great prequel. It’s the best stock THPS i think, THPS3 was great too (again on PC with the awesome LevelMod that included THPS 1&2 Levels) and then it went all downhill. Last THPS i played was Project 8 and it was just boring. THPS HD was good but could’ve been better, it’s funny how the THUGPRO Mod for Tony Hawk’s Underground 2 has more levels, more original songs and more of everything from the original Tony Hawk games than this HD remake offered. YES – The BEST game ever. What’s your high score, out of curiousity? rebought a psone just to play this and symphony of the night so I guess youre right. Tony Hawks 2 was my favourite of the series, hours spent on it on PS1 and Dreamcast.